I had an opportunity to play around with GNS3 briefly today; configured eBGP. I know a few things about the rules of an eBGP peering relationship from my past reading. So today I was aiming to validate what I thought I understood. Before starting up the BGP protocol and configuring the BGP peers, I configured a default gateway (Gateway of last resort on both sides of this WAN) in the end R1’s loopback 1.1.1.1 was able to ping 2.2.2.2 and vice-versa, all is perfect and well. Interesting. So you do not need to have exact routes in the routing table on both sides. Oddly enough, you don’t even need to have the static routes in place after the TCP handshake is completed and the session is established. I set the the protocol to 2 second keepalives just to be double sure – and sure enough it stayed up. 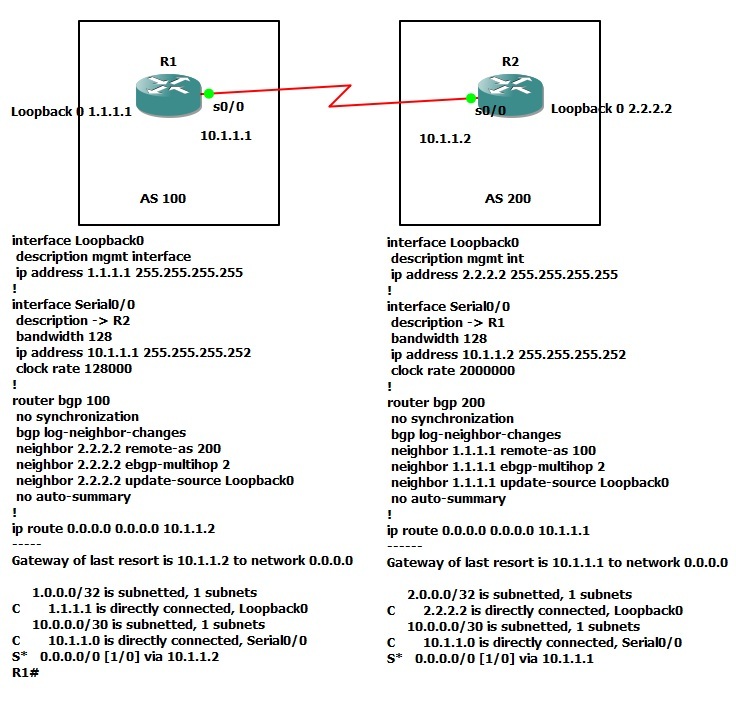 Lesson learned #1 – BGP peering requires a specific route (from the specific source initiating the TCP handshake) simply having IP connectivity or a gateway of last resort is not sufficient for the neighbor peering to establish. It only requires it on the side initiating the handshake, the replying device can have only a default route. Lesson learned #2 – BGP peering does not require a specific route once the TCP session is established, that means the requirement for a specific route in the table doesn’t exist so long as the TCP session is established. Lesson learned #3 – BGP bite you in the rear if you’re not patient and careful! That’s all for today peeps. Good fight and good nite!